When the Triple Creek wetland restoration effort began (left, 2016), vertical cut banks of up to 10 feet kept Myers Creek disconnected from its floodplain. After building structures that mimic beavers, the cutbanks are dramatically reduced and the water much closer to the floodplain (right, 2018). Photo courtesy Julie Vanderwal, Okanogan Highlights Alliance. As the world grapples with climate change, those commemorating World Wetlands Day Feb. 2 are highlighting the importance of restoring, conserving, and wisely using wetlands because they can help reduce floods, relieve droughts, and buffer coastlines from extreme weather. In the state of Washington, we work every day to protect and manage wetlands. The environmental and economic benefits they provide nature, our communities, and way of life are immeasurable. More likely than not, there’s a wetland near where you live, work, or play. Our state mandate is to ensure Washington does not lose any more acres of wetland and the functions they provide—as well as restore, enhance, and preserve these important resources. Wetlands provide important habitat for salmon that Washington’s endangered resident orca whales need to survive. We fund riparian restoration work in agricultural areas to benefit salmon. Wetlands also help filter and clean our drinking water. They control flooding and erosion while providing habitat for other fish and wildlife species. Washington’s wetlands help maintain a safe, healthy environment and economy. Wetland connected to Little Spokane River. In Washington, we recognize the harm climate change can have on wetlands—from sea water intrusion to water chemistry changes to even being the source of greenhouse gases when improperly disturbed. Carbon efficiently while emitting little methane. Twice as much carbon in coastal wetland soil than in all the world’s tropical forests. More carbon than they emit as wetlands mature. Large amounts of carbon in tree biomass, especially forested wetlands. Up to 700 billion tons of carbon around the world—including 96 million tons of carbon every year. Water that is released later in the season to mitigate the effects of drought. Many state residents are passionate about protecting existing wetlands while others are getting their hands wet and dirty, working hard to restore wetlands that have been degraded. There’s no better example than the Triple Creek wetland restoration project in north-central Washington. Located on Myers Creek in Okanogan County near the town of Chesaw, the Triple Creek project is part of a privately-owned forested wetland named after three main creeks: Myers, Bolster, and Thorp. Historically, Myers Creek cyclically spilled over its banks and inundated the Triple Creek floodplain, including a series of beaver ponds on the creek. However, the stream lost its connection to the floodplain in the late 1990s after a rain-on-snow event combined with other factors and left an incision trench with left vertical cut banks of up to 10 feet. The beaver ponds became breached and drained, no longer providing grade control or covering large areas of the floodplain. As the now-drier soils started favoring invasive plant species, a thriving great blue heron rookery was abandoned and the wetland became less able to filter and store water. Triple Creek in Okanogan County. The Triple Creek land stewards, who invested in 500 acres together, were disappointed to see a large part of their thriving wetland dry up. After exploring a variety of restoration options, the group selected the local non-profit entity Okanogan Highlands Alliance (OHA) to lead the restoration effort. OHA, in partnership with Trout Unlimited, U.S. Fish & Wildlife Service, and the National Oceanic and Atmospheric Administration’s Northwest Fisheries Science Center, worked with the land stewards to find the most cost effective ways to address the wetland degradation. The team seeks to improve hydrologic connectivity between Myers Creek and the adjacent wetland, improve fish and wildlife habitat including re-establishing beaver, and restore native wetland vegetation. OHA secured community-based, federal and state funding—including funds from the settlement agreement reached between Ecology and the owners of the Buckhorn Mountain gold mine for environmental remediation. In addition, local groups, clubs, students, and community members have so far provided more than 1,400 volunteer hours to help restore the wetland. From left to right: In August 2016, Triple Creek restoration team installs structure mimicking a beaver dam. In May 2017, the red arrow would be underwater as the structure is overtopped. In August 2017, the structure is adaptively managed to extend its functional life. By May 2018, Myers Creek comes close to spilling over its banks onto the floodplain. Photo courtesy Julie Vanderwal, Okanogan Highlands Alliance. The restoration team is focused on reducing the severe stream channel incision that disconnected Myers Creek from the floodplain. The project design mimics the work of beavers by using lines of wooden posts that are woven with branches to slow and redirect stream flows as needed. The structures help capture sediment to build the streambed back up and raise the water table. They also help make the channel longer while reducing its slope, making the system more stable. By emulating the effect of beavers to slow stream flows, capture sediment, and connect the water with the land, the project aims to improve water quality and increase water storage capacity. Re-establishing beavers, and the plant life they need, is a key component of mitigating local drought and fire issues—increasing resilience to climate change. Wetlands help store water that becomes available later in the season to support streams and underground sources of water, and to offset the effects of drought. ﻿The first structures were installed in the field season before two years of intense flooding, creating optimal conditions for transforming the site. As Myers Creek interacts with the human-made beaver dams, the team's objectives for the stream are being realized more rapidly than expected. In places, the streambed at the site is more than four feet higher now than when work started in 2016—with a 23 percent increase in the overall channel length of Myers Creek within the project area. 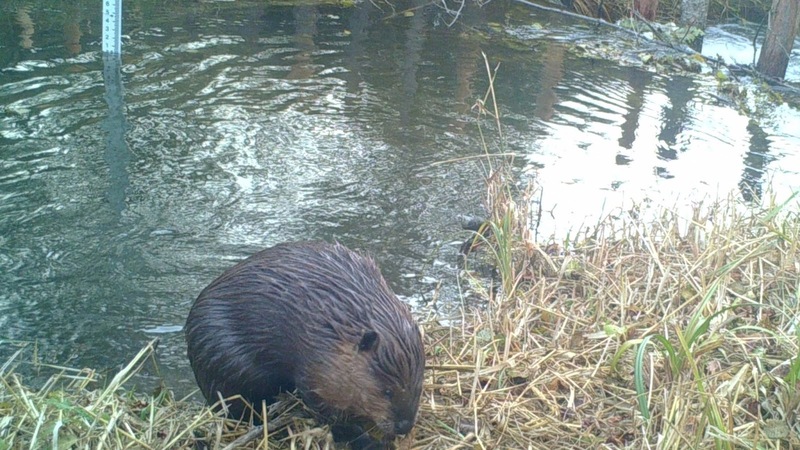 Beaver at the restoration site captured on wildlife camera in fall 2017. Natural beaver activity will be critical to long-term project success. The team continues to repair and enhance instream structures and is dedicated to establishing a healthy riparian plant community. A diverse and robust buffer zone will not only improve native vegetation but will encourage beavers to recolonize the area, and modify and maintain the site into the future.